https://d2wldr9tsuuj1b.cloudfront.net/5095/slideshows/homeMedium/20180721_194527.jpg AYC Thanks to St. Matthew community for all the support! Mission Statement: We are a multi-cultural community called by God to use our time, talent, and treasure to serve others by witnessing the Gospel values and promoting the sanctity of life. Somos una comunidad multicultural llamados por Dios a usar nuestro tiempo, talento y tesoro para servir a los demas dando testimonio de los valores del evangelio y protegiendo la santidad de la vida. 8:30 am Liturgy of the Hours. Mass begins after Liturgy of the Hours, around 8:45 am. No Mass on Monday, except for Holy Days of Obligation. Every Wednesday: 9:15 am - 4:00 Reconciliation: Every Saturday 3:30-4:30 or call the Office for an appointment. In 20 15, the Texas legislature amended several statutes to permit licensed carriers to openly carry handguns (HB910). These changes took effect on January 1, 2016. In a nutshell, HB910 simply changes current law related to licensed carriers of concealed handguns to permit licensed carriers to either openly carry handguns or to carry concealed handguns. Openly carrying a handgun requires the carrier to have the handgun properly holstered. A CHURCH or a place of business MAY PROHIBIT concealed handguns or openly-carried handguns, or both, in its buildings by providing notice under the statute. Notice may be accomplished in several ways: A) One may post signs at the public entrances of the building in a clearly visible manner. The text in the signs must be exactly as the statute prescribes in both English and Spanish. One may give NOTICE face-to-face, orally or in writing, to a licensed carrier that concealed handguns or openly carried handguns or both are not permitted in a building. Written notices must contain the same text as the signs. Effective immediately, IT IS TO BE KNOWN THAT OPENLY CARRIED HANDGUNS ARE NOT PERMITTED IN THE CHURCH OR ANY OF THE BUILDINGS OF ST. MATHEW THE EVANGELIST CATHOLIC CHURCH, HOUSTON, TEXAS. A written and oral notice will be presented to anyone openly carrying a handgun to remove the handgun from the building. If a licensed carrier violates the statute by not removing an openly carried handgun from the church or other building once written and oral notice is given to the person, the carrier may be guilty of a Class A misdemeanor, which is punishable by up to 1 year in jail, a fine up to $4,000, or both jail time and a fine. The penalty may be enhanced for repeat offenses. Additionally, the licensed carrier may lose his/her license for such a violation. If you have anything you would like to put on the church&apos;s website (including announcements, calendars, fliers, etc.) 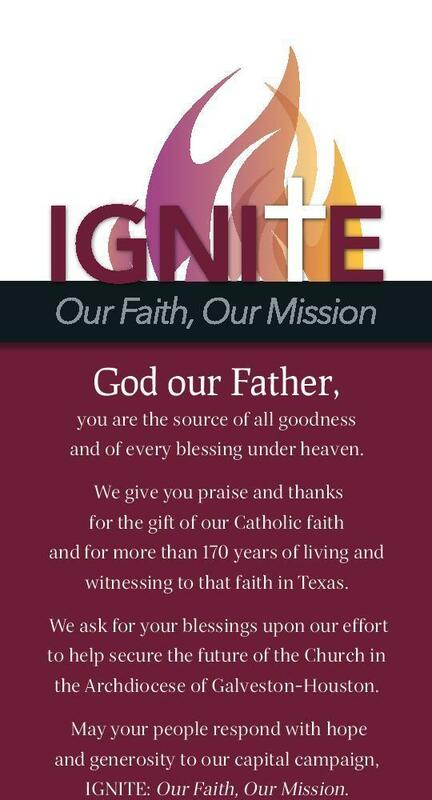 please email it to ravilasaldana@stmatthewhou.org or leave a written copy in the Parish Office.